By virtue of the Wild Card Game, the Astros didn't get to set their rotation the way they wanted to. The Royals did, and they played the hot hand, with Yordano Ventura taking the ball for an important G1 of the ALDS. Collin McHugh ain't no slouch on the hill, however, and he seems like a tough cookie in terms of his mental will and endurance. Not the worst guy to have start a series. The Astros have been playing elimination baseball for a while now. G162 was an elimination game of sorts - really, the whole of the last two series' were - not to mention the Wild Card Game. Contrast this to the Royals, who were the first in the AL to clinch. Perhaps the Astros are a little more battle hardened. Or alternatively, perhaps they aren't as well rested as the Royals, and don't have their rotation how they want to. Well, the Astros played like a battle-hardened team tonight. They made few mistakes, battled some tough conditions (both rain, and the rain delay) and were efficient getting runs across the plate. Their 'pen was solid. The Astros pitchers were perhaps the beneficiaries of some BABIP luck - some hard-hit balls from the Royals were converted into outs via some solid defensive work. I am not wanting to take anything away from the Astros, however - they went into a tough home environment, got an early lead, and played better baseball. They were deserved 5-2 winners, taking an important Game 1, which nullifies the home-field advantage that the Royals had. The Astros have now won six of their last eight on the road. The Astros opened the game with a strong frame in the top of the first. Jose Altuve took a slurvy breaking pitch inside for a single to LF, dumping it over the shortstop's head. George Springer fought Ventura for nine pitches, eventually drawing a walk on a full count fastball that Ventura pulled glove-side. Carlos Correa was in an early 0-2 hole before he evened the count, fouled off a couple, and hit a line-drive into RF on an elevated breaking pitch. That loaded the bases with no outs. I felt like I have been harping on about the inability of the Astros to move hitters over, or score hitters with productive outs this year. That wasn't the case tonight. With the bases loaded, Colby Rasmus stung one to the left of second baseman Ben Zobrist, and with his momentum taking him away from second base, Zobrist's only play was to first. That scored Altuve, and the other two runners both advanced. Evan Gattis then hit a slow chopper to shortstop to score the next run on a groundout. Perhaps I am giving the Astros hitters too much credit here - Rasmus simply hit one hard, and Gattis swung at the first pitch, but the ball ran in on him, and he got more handle than barrel. Valbuena struck out on a foul tip. The Astros kept working Ventura in the second frame, scoring another run for an early 3-0 lead. Ventura got the first two outs without incident - a Carter fly-out and a Castro K swinging - before Handsome Jake doubled to the LF-CF gap. Marisnick got an 0-2 fastball that was elevated and over the plate a little, and he lined it into the gap. The ball went all the way to the wall, and Handsome Jake took second standing up. Jose Altuve was the next batter, and he took a high fastball away, and lined it to RF. Alex Rios was playing in, and Marisnick was off and running with two outs. Pettis sent him, and Rios' throw looked to skid on the wet grass. Pérez, the catcher, made no real attempt to glove it - he just blocked it with his leg padding, and made sure that Altuve didn't advance past second (although he did advance to second on the throw). Marisnick scored without a tag attempt. Astros led by three at this point. McHugh was solid through the first two, battling drizzly rain for both innings. A Zobrist single on a line-drive into RF was the first KC hit of the game. Zobrist stole second, but McHugh bore down to get the next two outs without him advancing further. Both outs were on grounders to the respective corner infielders - both were well hit, but the fielders were well (and also conventionally) placed. Both Valbuena and Carter made nice plays. McHugh gave up a run in the second off a lead-off home run to Kendrys Morales (perhaps the hottest hitter in the game right now). The pitch was a 1-2 fastball inside and belt-high, and Morales got enough barrel on it to drive it out down the RF line, wrapping it around the foul pole. McHugh rebounded to get the next three outs in order. By this time, the light rain that had been coming down got a lot heavier, and the game entered a rain delay. After a 49-minute break, the Astros grabbed their bats to start the third. The Royals shoulder-tapped Chris Young to take the mound, and he brought nasty strikeout stuff into the game. Young struck out Correa looking on a full-count pitch (a fastball that missed the target down and away, but ran over the inside corner), then walked Rasmus, then stuck out Gattis and Valbuena to end the inning. And the strikeouts didn't stop there. Carter, Castro and Marisnick went down in order in the fourth (on 12 pitches, too), meaning Young had struck out 6 of the 7 hitters that he faced in his first two innings of work. McHugh, unlike Ventura, returned after the break. He seemed to enjoy having a little more grip on the ball, and he retired the side in order on 11 pitches in the third inning. In the fourth, McHugh was again victimised by Kendrys Morales with two outs. Prior to that, Lorenzo Cain had lined out on a hard hit ball that sliced back toward Jose Altuve, diving to his right. That would have been an easy single, but instead, the bases were empty when Morales took a 1-1 belt-high changeup inside, and he deposited it into the RF power alley for his second home run of the night. The fifth frame was the crucial inning in the game. The Astros entered, leading 3-2, and Chris Young had just struck out two-thirds of the Astros' order. Jose Altuve opened the frame by dumping a soft liner into RF for a single. He waited for three pitches, then he tried to steal. Sal Pérez is fast in terms of pop times, and he was helped by the pitch, which was a high fastball that missed a little up. Anyhow, the throw was perfect, and Altuve slid into the tag for a caught stealing. I wondered at the time whether that would be pretty big. I wondered a little more when George Springer pounded a high fastball away into the LF gap for a home run. The ball was meant to be down-and-away, but it ran back over the plate, and missed thigh-high. Springer turned on it, and hit a towering shot into the second row of the LF power-alley. That description doesn't do it justice, because the wall is around 10ft high at that point, and the seats are fairly elevated too, so it was not a cheap home run by any stretch. The bottom of the fifth was also important. Collin McHugh opened by retiring Sal Pérez on a fly-out to CF. But then Alex Gordon singled on a liner into RF, and Alex Rios walked on a 3-1 count to put runners at first and second with one out. Alcides Escobar was next up, and he got a cutter away on a 1-0 count, lining it into CF. The cutting action of the fastball took it off the end of the bat a little softening its flight, but Marisnick in CF made a great read, and he caught the ball coming in hard, and dove to made the catch. It was a comfortable diving catch at the end - an incredibly difficult play that Marisnick made look easy with a great read, and great speed. That was a crucial second out, and when Ben Zobrist grounded out to a shifted shortstop, the threat was over. McHugh came out for the sixth - Fields had been warming up in the fifth - and he retired the first two without incident. That brought Morales to the plate, and he hit a hard liner on a 2-2 count to RF. Springer made the play without trouble. That was all for McHugh - a solid line of six innings, four hits and one walk, one strikeout, giving up two runs - both on solo shots to Kendrys Morales. McHugh effectively managed an hour-long break in the middle of his outing, and he left the game with a 4-2 lead. Kelvin Herrera pitched the seventh for the Royals. He allowed a Marisnick lead-off single on a liner into RF, but retired the remaining Astros in order. Herrera blew up Altuve inside for a weak grounder, and he struck out both Springer and Correa to end the frame. Ryan Madson got the eighth, and he got ambushed by Colby Rasmus, who hit his ninth home run in his last 21 games. The pitch was a first-pitch fastball (the first pitch of the inning, too) that was meant to be inside, but it missed a little up. Rasmus smashed it all the way to the fountains in the RF power-alley - that home run was estimated at 439 feet. Evan Gattis followed with a single into LF, but the remaining Astros hitters in the eighth struck out in order to strand him there. In the ninth, a two-out Springer single up the middle was the only action. Tony Sipp pitched the bottom of the seventh for the Astros, retiring the side on three consecutive groundouts. Sal Pérez was one of the victims - he hammered a hard grounder to Valbuena's right, which Valbeuna stabbed, crow-hopped, and made an easy throw for the force on the slow-moving catcher. Will Harris got the eighth - he got the first two outs without problem before Ben Zobrist hit a seeing-eye single up the middle, then Lorenzo Cain singled on a hanging curveball to put runners on first and second. Oliver Pérez relieved, and he LOOGY'd Eric Hosmer into a foul out to third base, standing both the runners. The wind seemed to blow the ball back out of the stands, toward the field of play, and Valbuena made a comfortable catch. That set up Luke Gregerson for the ninth. Gregerson struck out Morales for the first out, and quickly got ahead on Mike Moustakas. He spiked his slider, however, and it caught the Moose in the foot, sending him to first base. Gregerson - who has looked really sharp in his last few outings - quashed the threat by striking out Sal Pérez on a nasty cutter, and getting Alex Gordon to foul out to left. Similar to the last out of the eighth, the wind may have brought the ball back into play, out of the stands. The celebrations were fairly muted, and the Astros perhaps have a less favourable matchup tomorrow - at least from the pitching perspective. They are guaranteed to leave Kansas City with at least a 1-1 record, giving them the opportunity to close back in Houston. If they win tomorrow, then KC is in a deep hole, especially with Keuchel on the bump for Game 3. 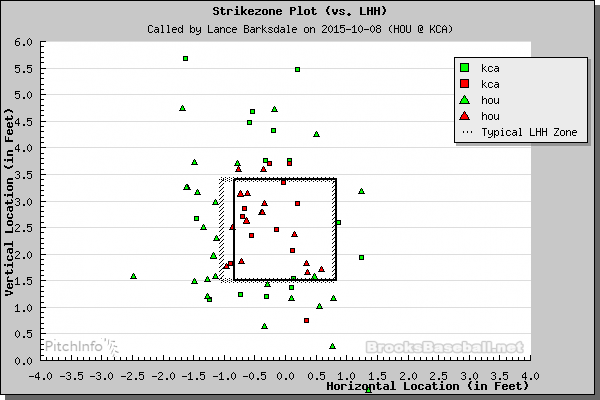 The Astros clustered their hits in the 9-1-2 parts of the order. Handsome Jake in the nine-hole went 2-4, Jose Altuve went 3-5 and George Springer went 2-4 with a home run and a walk. Carlos Correa had only a first inning single in five plate appearances. Colby Rasmus - batting four - went 1-3 with a walk and a home run, and Evan Gattis and Chris Carter both went 1-4. The Astros, however, struck out a hefty 14 times, but what really mattered is they outscored their opposition. Turning Point: The important inning of the game was the fifth. The Astros ran into an out shortly before hitting a home run. The Royals got the go-ahead run to the plate with one out, but an exceptional defensive play from Handsome Jake - who had a great game overall - meant that a vital second out was logged. The Royals didn't score, and the Astros had a lead that they would not give up. The outfield was awesome. Long home runs were logged from Springer and Rasmus, and Marisnick made a stellar play on defense, and logged two hits at the plate. There are some awful calls there - calls that are inconsistent, and well out of the zone. They mostly favour the Royals. Scott Kazmir versus Johnny Cueto, in the battle of the struggling trade acquisitions.